Ambitious climate change plan at risk of being pulled apart at council, advocates warn. A rescue pole, life buoy and ladder stand at the edge of where the waterway in the island channel should be. 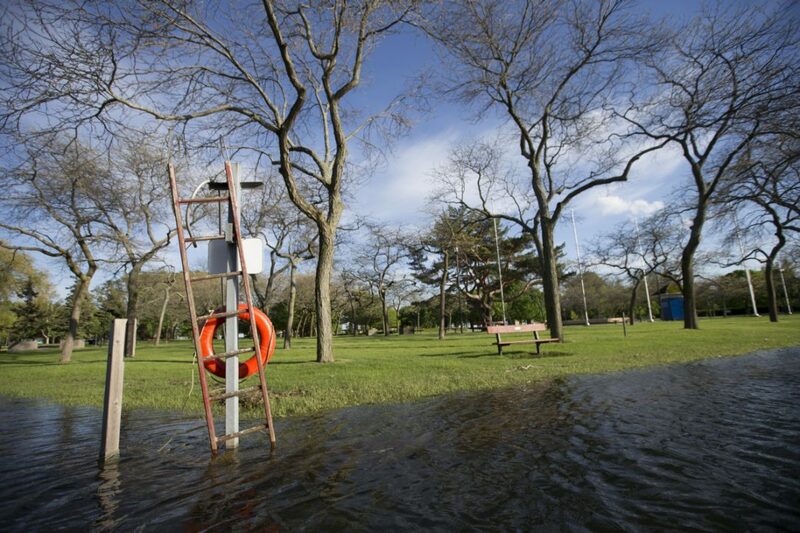 The city has announced the Toronto Islands will be closed to the public until end of July due to the ongoing flooding issue. Advocates of what has been called an ambitious climate change action plan fear Mayor John Tory and allies want to pull the plan apart to fund just pieces of it. That debate on the TransformTO plan will unfold at council next week, where the rising cost of lost revenues and flood repairs on Toronto Island and along the waterfront is also on the agenda. But council critics and environmental advocates say the plan before council is already prioritized based on more than two years of work that included consultations with the community and experts. “It’s like saying, ‘Which of the legs in a three legged stool are we going to get rid of?’” said Franz Hartmann, executive director of the Toronto Environmental Alliance. He said not moving forward with the plan as presented would undermine the overall goal of achieving an 80 per reduction in greenhouse gas emissions from 1990 levels by 2050. “What council is looking at is the result of a priority-setting exercise,” Hartmann said, adding $6.7 million is a “drop in the bucket” relative to the city’s billions-dollar budget. In the meantime, Hartmann said the city continues to pay the severe financial consequences of extreme weather. After unprecedented flooding this spring, a separate staff report to council next week estimates a loss of $5 million already in revenues related to the ferry and island park closure. That is assuming the island becomes more accessible to the public as of Aug. 1 and regular ferry service resumes. That cost does not include daily expenses related to flood management or necessary repairs to infrastructure that is largely still under water, and beach clean-up. Staff have also requested the authority to temporarily suspend rent collection and fees for island tenants that are paid to the city, including Centreville and several boat clubs, while the city considers whether to partially or fully forgive those costs — what would contribute to the city’s overall losses. Councillor Gord Perks, a former Greenpeace campaigner, said the TransformTO plan was deferred from the last council meeting because of behind-the-scenes discussions that prioritization was required to see any funding approved. “This is very explicitly a consequence of the mayor trying to set a budget direction without having clear policy goals, such as protecting the climate, protected from his budget freeze,” Perks said, referring to an initial budget target of zero increases across divisions. Perks said the plan is designed with different elements working together — for example a future that is more reliant on electric cars means the need to reduce electricity consumption elsewhere.